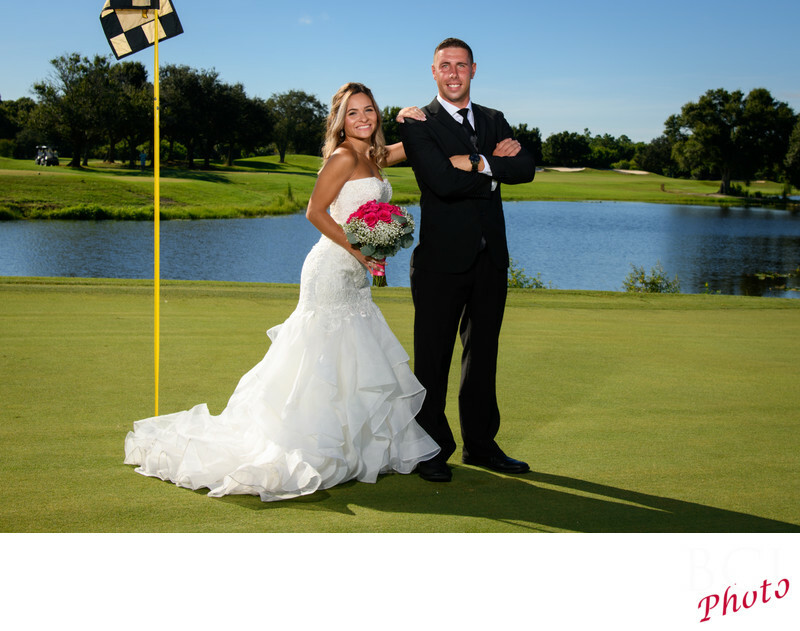 Some fun couples interaction shots taken out on the golf course at the fairwinds golf course in ft pierce florida. As you can see the shot looks like natural light, as it appears close to the way the human eye would see it. But without our dynamic location lighting, the image could not appear like this. this type of shot, simply can not be accomplished by using natural light alone. The camera simply can not see as the human eye can, correctly exposing both the bright sky behind and the beautiful wedding couple. There is not enough dynamic range. The only way to produce this shot so it matches the way your eye sees it, is to augment the existing natural light with our professional outdoor portrait lighting. By carefully matching the exposure values of the bride and groom with those of the sky and background, now it appears just like we "saw" it with our own eyes.